My first/last and only visit to Nick's was very disappointing back in 08 or 09 . I asked for medium rare and was given well done. Portions were quite skimpy too. I still enjoyed my very first visit to Kelly's, my second not so much. I still don't get the phenom about "North Shore" roast beef sandwiches (come to think of it I've only heard the term coined from a certain former food editor who used to be on the forum and others seemed to embrace it afterwards) - Roast beef sandwiches on a Kaiser bun are everywhere. Sorry to hear that, WJ. My buddy Doug & I went to Nick's after a Sox game in 2011 and I was rewarded with this beauty. With regard to the term being coined by a certain former food editor, I lived in Boston from 1997-2003 and hadn't heard of the Sterns or Roadfood at that point, but my friends and I knew about the North Shore style roast beef sandwiches and ate many of them at Nick's in Beverly and Kelly's in Revere. Smitty in CT, great list and I hope to make it to some of them one day. I've heard good things about Alamo Roast Beef in Medford. While it's a spin of sorts of the classic roast beef sandwich found in the region, the "Roast Beef 1000" (slow-roasted beef, crispy shallots, 1000 Island dressing and sharp cheddar on a brioche bun) that I split with Amy Briesch when we had lunch at Cutty's in Brookline back in November of 2012 was outstanding. And Chris Ayers put me on to Roast Beast on Commonwealth Ave. in Allston. While they don't roast the beef in-house, it was a darn good sandwich and if you're a hungry B.U. or BC student without a car, it scratches that itch when you can't make it out of Boston (proper) to satisfy the craving! 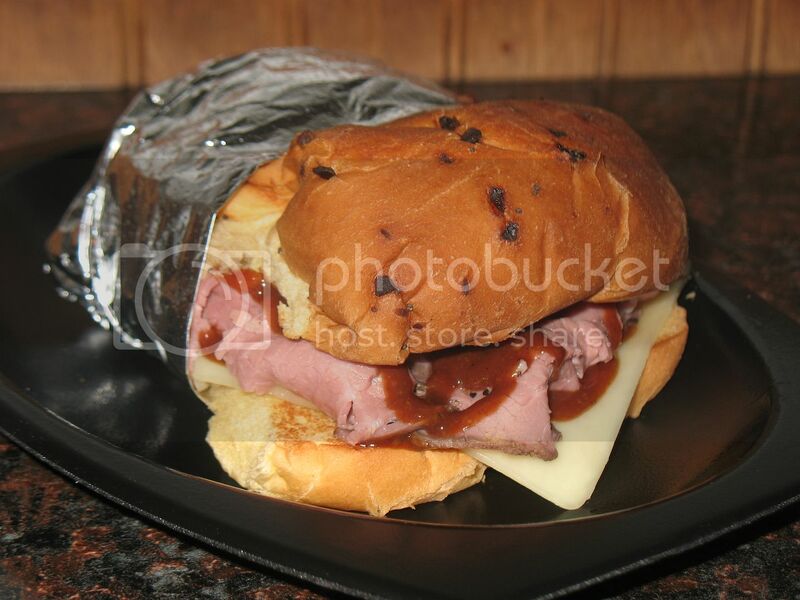 This regular roast beef on an onion roll with Vermont cheddar and Secret Beast Sauce (a sweet honey barbecue sauce), that Chris recommended, was terrific. - Roast beef sandwiches on a Kaiser bun are everywhere. While that is true, the same could be said for smoothies. I pass juice bars and smoothie trucks and carts multiple times a day on my walks throughout NYC. However, I think we can both agree that the smoothie is not a regional specialty of NYC! What makes something a regional specialty is that it has a history in the region, loyal fans (who will usually get into a debate about who makes the best one!) and a high concentration of places serving it in a small region. 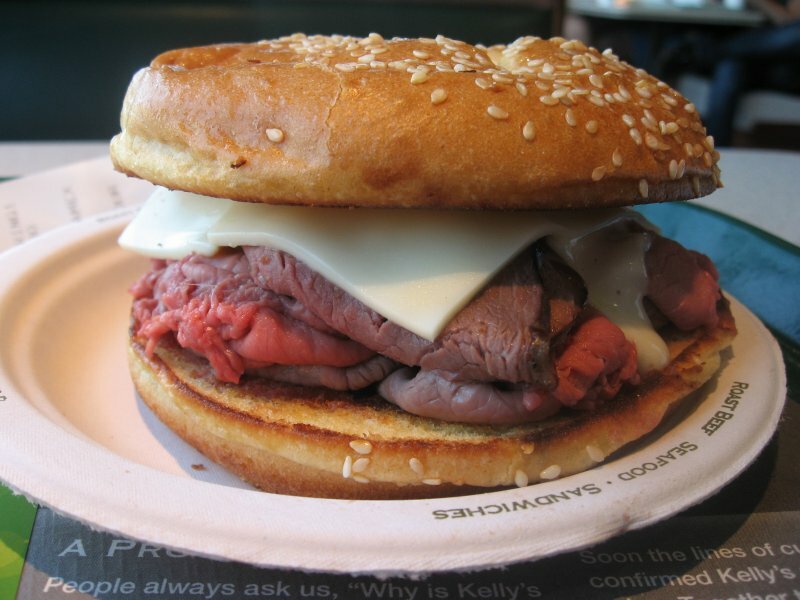 I'd argue that Boston's North Shore has the Super Beef (roasted in-house) on an onion roll, Brooklyn has it's own style with fresh mozzarella and gravy, Buffalo has the "beef-on-weck" and Baltimore has it's own as well with the "pit beef" sandwiches. On the other hand this sandwich served to me at Kelly's a couple of months later was quite the surprise. I wish every sandwich I had there afterwards was just as good- however it wasn't. Ayersian and I along with Sandra went to another roast beef joint on the north shore also famous for their pizza roll ups but I can't remember the name of the place this was a few years ago. The Stern's admittedly had never heard of North Shore Roast Beef Sandwiches until that "certain food editor" stood out from the rest of us by raising their hand to volunteer if you notice it's not even in those "pre website" Roadfood books. Throughout the years I have asked my Boston colleagues (who are fairly food saavy) what their favorite "north shore Roast Beef Sandwich" was. And I get essentially the same confused responses. When I tried to explain it to them, they just got more confused. 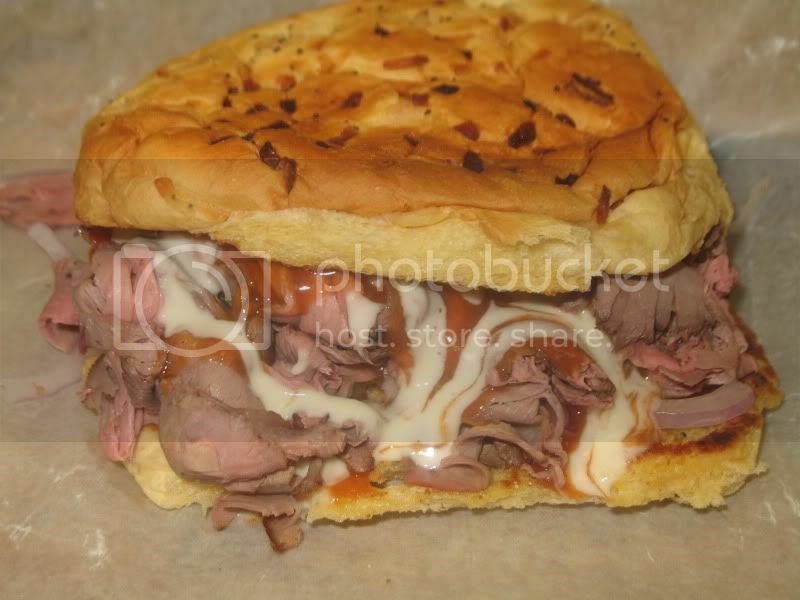 I just did a Google search for North Shore Roast Beef Sandwich and got back a lot of results dating back to at least 2003. Even Chowhound has a definition of it that stands out in the search. I would guess it is a thing, but not outside the North Shore or the people who know about it. Well, at the risk of incurring the wrath of Roadfood's self-appointed golden boy...Not trying to start trouble, far be it for me to argue with he who is always, always right. But, I feel the need to add an anecdote. Picture it, Boston, 1975, A Marriott, or Raddison, or, Hyatt? who knows? some fancy and very tall hotel. Not sure...I was 8. My Dad asks the friendly parking garage guy where would be a good place to stop for lunch, and the guy says, "Oh, goin' up, ya goddagedda nawth shaw beef... an, ged the sawase. I did not understand anything but "beef" but I said Yay. and we stopped somewhere with a red sign and no view of the ocean...and it was delightful. So. there you go. Godda ged a beef awn the nawth shaw. 1975. Oh...and NO disrespect to the Fantastic Sterns, Never! but in the early books they had never heard of coleslaw on a pork sandwich...jus' 'cause they did not know about something does not mean it was not a thing. 2003 was right about the the time "that certain former food editor" from the throng of forum members raised his hand to volunteer. I even asked my girlfriend's sister and brother in law who have lived in Boston for decades and even they never heard of it. Thankfully after notifying one of the moderators it was determined that whoever was sending out the unwarranted spam flag was a fake poster who signed on with a bogus e-mail just to spam my comments. You said it...those folks who create duplicate or fake accounts just to further their agenda can be a real pain in the posterior. Thanks to Paul for looking into this- of course I would have contacted you but you don't hang out here as much , but you do the thankless job just as well- and don't let Joe Rogo tell you otherwise. My only experience with a sandwich like this was at Nick's Roast Beef and Seafood.....in Columbus, OH. I liked it quite a bit but it is long gone. So last December when we went to Boston for a few days, I was determined to find an authentic one. Without a car I think most of those listed above were out of the question. So I found one that looked pretty good within walking distance of our hotel in Cambridge - Skampa. Closed! There was a ten alarm fire in Cambridge that day and a lot of businesses lost power. I had never heard of a ten alarm fire but I do know that the smoke was everywhere. Anyways we just walked down the street and blindly walked into Eastside bar and Grill and had a great meal. But I still need to go back and get a roast beef sandwich somewhere. hatteras04, Skampa looks mighty good and that Super Beef on an onion roll is right what I could go for about now! 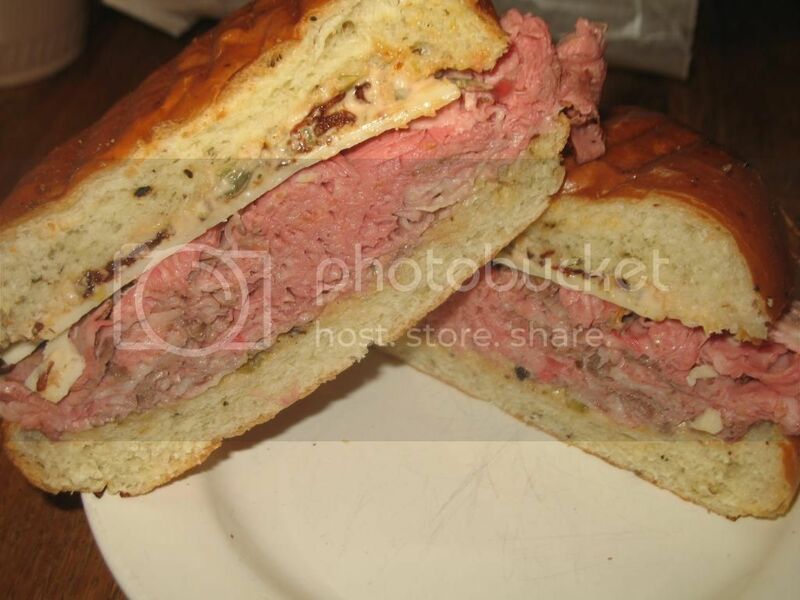 Nice to hear about another roast beef sandwich shop that is walking distance from the "T". I did this post on my food blog! Link is here.